Yellow gold PVD stainless steel case and bracelet with GG blooms pattern leather insert. Yellow gold dial face includes brand name. 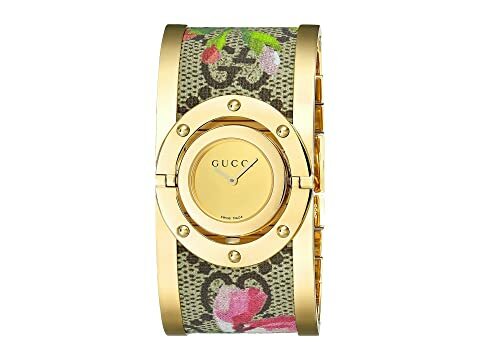 Dial twirls vertically to reveal the Gucci® bee design and interlocking G caseback. Pull/push crown at 6 o'clock position. We can't currently find any similar items for the Twirl - YA112443 by Gucci. Sorry!